Forty-year-old Kimberly Micheloni had a very bad week earlier this month. 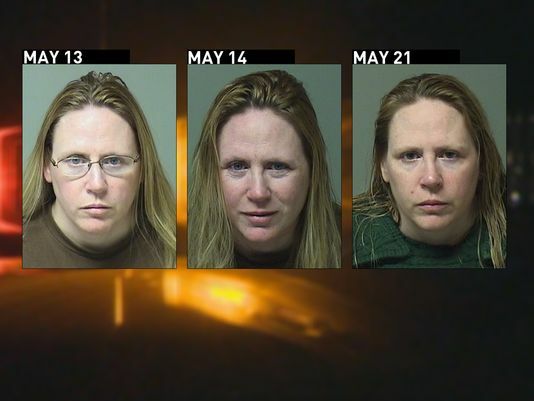 On May 13th, police pulled her over for driving under the influence with her 14-year-old daughter in the vehicle. In addition to being slapped with a DUI charge, Micheloni also faces a child abuse charge in connection with that stop. Court records show that police arrested her again for DUI the very next day. And on May 20th, police caught her yet again for driving under the influence and proceed to hold her on a $225,000 bond. According to reports, Micheloni recently had to leave her job as an office manager for the Internal Revenue Service because of an illness. She confided about her DUI arrests to a local TV news station, saying “I’m so sorry” for causing pain and potentially putting people’s lives in danger. She told reporters that her doctor had prescribed her a medication, which apparently made her unable to drive safely. Normally, prescription medications like Vicodin come with warning labels urging patients to avoid driving. In Los Angeles, you can get arrested and charged per California Vehicle Code Section 23152 for a drug DUI. There are no breath tests for drug DUI; instead, police typically ask for a urine sample to test your blood for chemical residue of drugs. Depending on the circumstances, you may be able to challenge the results of this urine test. • Maybe there was some weird interaction between your medication another med. For help getting to the bottom of your Los Angeles DUI drug defense, call experienced former prosecutor Michael Kraut of the Kraut Law Group. In addition to being a Harvard Law School educated attorney, Mr. Kraut retains excellent relationships with many people in the Los Angeles defense community, including judges, prosecutors, police officers, etc.